FTP stands for File Transfer Protocol. It is a mechanism for transferring files between a local computer and a web server using standard TCP / IP protocol. FTP uses client-server architecture to transfer files between the host server and remote computer. In order to use FTP you need to have a FTP account with hosting company to access the server and special FTP programs installed locally on your PC or Mac. Create a FTP account on your hosting server. Setup file permissions in cPanel if required. Generally the permission is by default available to the FTP account. Install FTP client on local computer. Configure FTP account on FTP client. 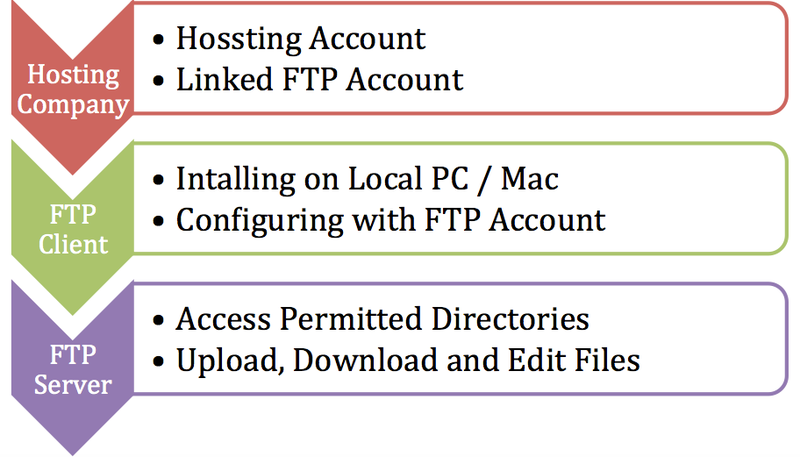 Login to the FTP client program using FTP account and remotely access the hosting server to upload, download and modify files located on a server. Modifying .htaccess file for setting redirection. Modifying robots.txt file in order to restrict search engine crawlers. Editing core installation files like wp-config.php to achieve specific features which can’t be done through the front end. Restoring the content during emergency situations. It is highly recommended to have a FTP access with WordPress hosting company so that you can restore the site on emergency situations without relying on others. Once the software is installed, you need to configure by adding the server, port, FTP username and password to connect to your hosting server. Below is how the site manager (configuration screen) looks like in FileZilla. Enter host name, port, protocol, user and password details obtained from your FTP account on hosting server. Click “Connect” button to connect to your hosting server remotely. Once connected, the configurations are saved successfully. Hence, you can quickly reconnect to the same server without doing configuration every time. Learn more on connecting FileZilla to Bluehost and FileZilla guide for beginners.